For decades, McCabe’s Department Store was a downtown Rock Island institution. With multiple locations, it became the standard for retail, even challenging larger chains with its customer loyalty. Our colored postcard from Shannon Hall’s collection shows the “new” L.S. McCabe’s building at 1713 3rd Avenue. Although postmarked 1911, the same picture, complete with a pair of horse drawn carriages, was first published in the 1902-04 subscription photo series “Picturesque Tri Cities.” These two carriages in front of the building may imply that McCabe’s catered to the upscale “carriage” trade. A very similar picture of the building was taken about 1915. The building appeared identical, but that time there was an auto in front and large awnings shaded the street level show windows. Levi S. McCabe opened his first store in “Palace Row” near 16th Street and 2nd Avenue in 1870, calling it McCabe’s Plunder Shop. Plunder didn’t mean the merchandise was of shady origin, rather the term simply referred to personal or household goods – clothing and housewares. As the business grew, he moved the store to a larger site a block east at 1714-22 Second Avenue. By 1900, L.S. 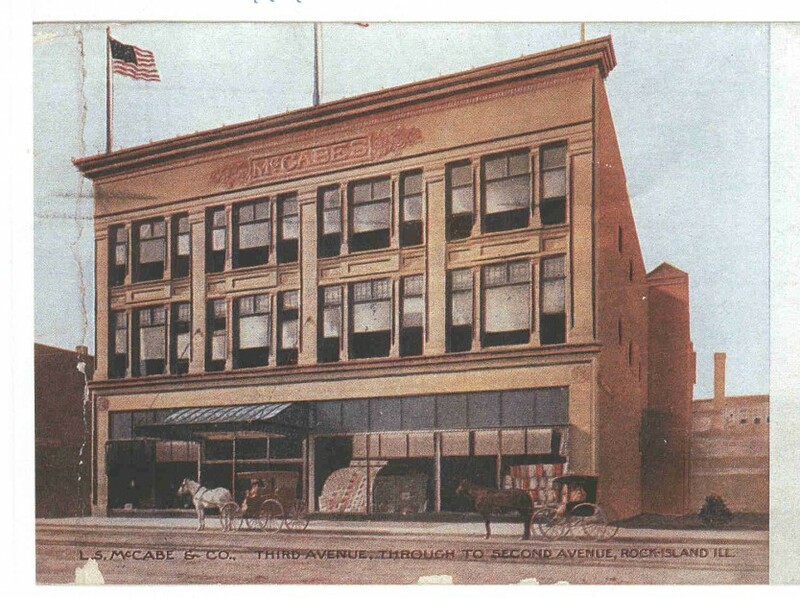 McCabe was prosperous enough to build the Third Avenue postcard building at a reported cost of $75,000 or $85,000. The Moline Dispatch of April 16, 1900 said architects Drack & Kerns plans were ready for what would be most expensive structure for purely mercantile purposes ever built in Rock Island. Collins Bros received the general contract for the building which was described as “of the Renaissance order” with a first story largely of plate glass and featuring large windows in upper stories for maximum natural lighting. The Second Avenue store directly behind the new building still continued to operate because of the concern that customers would never go all the way to Third Avenue to shop. A dozen years later, the new store was remodeled to the tune of $40,000, which may be when a second floor “skywalk” was built across the alley, thus allowing shoppers who entered on Second Avenue to access the Third Avenue store without going outside. McCabe was an aggressive retailer, who believed strongly in advertising and special sales. In January and July, everything in his store was priced at 20 percent off. Although he died in 1915 at age 79, his family continued to operate the store until the late 1920s, when the business was sold. Retailing continued under a new name: Arthur J. Hause Company. Around 1950, the store was called McCabe-Hause and a decade later, until its final closing in 1985, was simply, once again, McCabe’s. The building is now home to Hyman’s Furniture Store. After Hyman’s closed in 2011, the building was purchased and repurposed as the Stern Center, a party, reception and celebration facility, an excellent example of adaptive reuse of a historic building. L. S. McCabe’s original building presented a dignified appearance to the street. Five column-like two-story “pilasters” divided the front facade into four areas, each of which was further divided by smaller, one-story pilasters. The large “Chicago style” three-part windows would have flooded the interior with sunlight. The south light may have been too bright at times — notice that there are window shades hanging at varying levels. At street level, wide display windows provided plenty of space to display the latest wares. Their transoms contained tiny square panes of embossed “prism” glass. McCabe’s store was built before the bank building which is adjacent to it today, thus its elevator shaft can be seen near the far right of the postcard. The rooftop held three flagpoles, one in the center front and another at each front corner. The crowning touch was the McCabe name at the top of the building, just beneath the cornice. It stood in relief and was embellished with ornate masonry ornament. Today, the postcard structure is hidden by shiny gold-colored aluminum panels. The elaborate deep cornice on the top has been removed as has the graceful wire-glass and iron portico that once sheltered the main entrance. Yet it is likely that much of the masonry detailing on the front is simply hidden by the newer aluminum panels. Even the McCabe’s name may have been preserved underneath rather than being chipped away when the panels were installed. If and when this 1960s façade is removed, the old McCabe’s building be able to have the last word. This article by Diane Oestreich is slightly modified from the original, which appeared in the Rock Island Argus and Moline Dispatch on May 1, 2005.